While piggybacking on events to sell products typically gets overlooked by consumers, some Brands that do it leave me scratching my head. Here’s a message I just received. 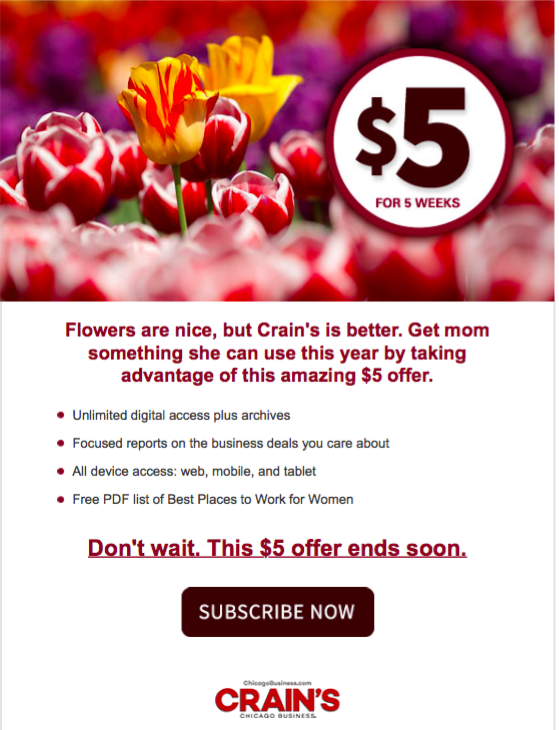 Sorry to hurt your feelings Crain’s, but I know a lot of mothers of all different ages and can tell you without a doubt that at least 99% of them would appreciate flowers over a 5 week subscription to Crain’s. Your gift advice might even land some of us in emotional solitary confinement. What’s worse is their copy shows that they’re really not selling me on buying this for my mom, they’re selling me on buying it for me. “Focused reports on the business deals you care about.” What about the business deals my mom cares about? After all, I’m supposed to be sending this to her. But how many of us even know about the business deals our mother cares about? Crain’s, you shouldn’t jump on the Mother’s Day train to try to sell your products. Or Father’s Day. Or really any holiday. Just because they are gift-giving days, doesn’t mean you should try to claim you’re a great gift.